Hardy Elementary School in Hamilton County Schools was the beneficiary of a new Burlington store opening in the Chattanooga area. Representatives from Burlington visited the school to present the teachers at Hardy Elementary a check for $10,000 to use for funding needed items in the classrooms. Burlington presented the check through AdoptAClassroom.org. Hardy held a school assembly to surprise the entire faculty and staff with the Burlington gift. 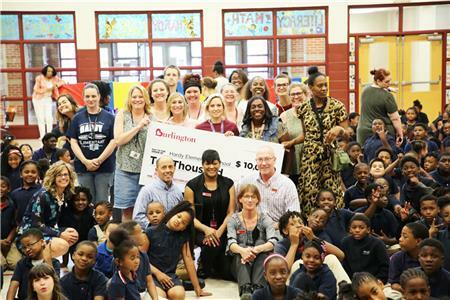 The new Burlington store’s team members visited the school to make the presentation of the large check. The teachers will be able to equally access the funds for their classroom and shop for supplies through AdoptAClassroom.org. A virtual savings account has been set up for each teacher at Hardy, and they will be able to shop for classroom supplies right on the AdoptAClassroom site. Burlington is a national off-price retailer with a new 40,000-square foot store in Chattanooga in the Waterside lifestyle center in East Brainerd on Lifestyle Way.